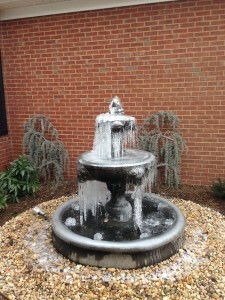 Our customer in Easley, SC, Jackie, was looking to have a fountain installed in his front lawn. They add such great curb appeal and are peaceful at night. Jackie loved the look of her friend’s fountain, who happened to get their installation done by Cochran Landscaping. Jackie called us the next day. She already knew which style she was wanting and we came out for the job. 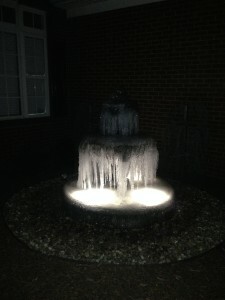 Jackie said, “this fountain looks awesome with the LED lights you guys installed.” She loves her new fountain! Check out some of our cool winter pictures posted below! For more information on our Cochran water fountain installations, click here!